During the year following his inauspicious parting of ways with Revue Studios, director Robert Altman survived by working on commercials, occasional TV episodes and other modest projects — and by taking out personal loans from friends and business associates. Ray Wagner, a Revue producer impressed with Altman’s work, had sought out the iconoclast director, proposing a partnership to develop various film and television properties. Wagner eventually resigned his post at Universal Television (as Revue was known by that time) to form the Wagner–Altman Co. in April 1965. Three of the projects developed under this aegis came to fruition in one form or another: a screen adaptation of the novel Me and the Arch Kook Petulia; Death Where Is Thy Sting-a-ling-ling?, originally envisioned as a TV series about World War I pilots, but eventually a feature project with a Roald Dahl script; and Chicago, Chicago, a TV series concerning an interstate police agency patrolling the Great Lakes region. Unfortunately for Altman, who desperately wanted to move from television to features, no movie studio would touch either film project with him at the helm. Meanwhile, CBS had expressed interest in Chicago, Chicago, but only if Altman directed. As a result, Wagner and Altman sold the Death script outright (bringing Altman a much-needed paycheck), while Wagner took charge of the Petulia script (which became a great success for director Richard Lester, to Altman’s great displeasure), leaving Altman to direct the TV pilot with Wagner co-producing. As a result, a rift developed between Wagner and Altman — their partnership would not last long. When CBS greenlit the Chicago, Chicago project — now called Nightwatch — in late August 1965, Altman headed to the Windy City to commence production. Locations included Chicago’s Navy Pier, its Old Town and Andersonville neighborhoods, Swedish Covenant Hospital and Eli’s Stage Delicatessen, with additional filming in Milwaukee and Toronto extending into October. Carroll O’Connor, Andrew Duggan and Michael Murphy (a frequent Altman supporting player) starred as members of the Great Lakes Interstate Bureau (G.L.I.B.) who, in the pilot (titled “The Suitcase”), hunt for a Swedish sailor after he jumps ship carrying a piece of luggage that — unbeknownst to him — contains a time bomb. The action takes place entirely at night, following the sailor through the streets of Chicago and eventually to a Milwaukee residential neighborhood. Regular Altman collaborators Brian McKay and Robert Eggenweiler wrote the script, based on an Altman story. Both the scenario and the use of high-speed film stock to shoot night-time scenes with minimal lighting looked back to the Kraft Suspense Theater episode “Once Upon a Savage Night,” while documentary-style handheld camerawork, a couple scenes with overlapping dialogue and an emphasis on quirky character traits for even minor supporting players foreshadowed the unique cinematic style Altman would perfect during the 1970s. Nightwatch made a short list of new programs under consideration for the fall 1966 CBS schedule, but ultimately a Desilu pilot got the nod for the network’s open time slot on Saturday nights at 9:00 p.m. Although Lucille Ball’s pending contract renewal for The Lucy Show provided Desilu considerable bargaining power, few would argue that CBS made the wrong decision, given the subsequent success and iconic pop-culture status of the series in question, Mission: Impossible. “The Suitcase” remained unseen by the public for over two years, until CBS finally broadcast it — trimmed from 64 minutes (during that era, networks often received pilot films that stretched beyond the length of their projected time slot) and retitled “A Walk in the Night” — on July 15, 1968, as an episode of Premiere, a summer anthology series devoted to unsold pilots. The network would air the program one more time (on another summer anthology series, Suspense Playhouse) on June 21, 1971, mere days before Altman’s McCabe & Mrs. Miller hit theaters. By this point, the director had achieved fame with MASH and Brewster McCloud. To score Nightwatch, Altman turned to his friend and colleague Johnny Williams, with whom he had worked at Revue on both Kraft Mystery Theater and Kraft Suspense Theater. Williams himself had left full-time work at Revue in mid-1964 to pursue feature-film opportunities, padding his workload with occasional episode scores for Revue and other television studios, and scoring several pilots. CBS music director Morton Stevens conducted an initial Nightwatch session at Capitol Records on November 22 to record the series theme and format music, employing an orchestra consisting of: 1 flute, 2 clarinets, 4 horns, 2 trumpets, 3 guitars, 2 percussionists (Shelly Manne and Williams’ father), 12 violins and 1 bass. Williams devised two short “bumpers” for use during commercial breaks: the first derives from the theme’s coda, while the second adds a bit of the rhythmic ostinato and a phrase from the theme. He also created a “promo” cue: had CBS picked up Nightwatch as a series, the network would likely have used this longer piece of format music — essentially the main title’s rhythmic ostinato without its overlying theme — to preview scenes from each forthcoming episode. Williams’ Nightwatch theme begins with a four-note motive (C–B–E♭–D) stated by violins, quickly joined by a dramatic ascending trumpet lick. Pounding timpani then introduce a churning rhythmic ostinato that underpins the long-lined main theme played by trumpets and violins. All of this repeats, leading to a brief but forceful coda. The Nightwatch theme accompanied a striking opening credit sequence created by Reza Badiyi, then a close associate of Altman and later a prolific television director. Badiyi inscribed the program’s title and the credits for its three lead actors onto pieces of glass, then used a light box to project them onto a huge sheet of curved plexiglass with water dripping down it to create a surreal effect: the credits appear to float through the frame against night-time images of police vehicles. “Everyone just loved it,” he recalled in a 2003 interview. In the years that followed, Badiyi would create some of television’s most memorable credit sequences, including Get Smart, Hawaii Five-0 and The Mary Tyler Moore Show. On January 6, 1966, Williams himself conducted the remainder of his score during a split session at CBS in Studio City that Stevens also used to record music for a second-season Gilligan’s Island episode (“Gilligan’s Living Doll”). Although Williams’ Nightwatch theme does not appear intact in his pilot score, a recurring 5/4 ostinato for the bomb-laden suitcase recalls the main title’s accompanying rhythmic figure and the opening trumpet lick from the series theme resembles ascending French horn phrases heard during the episode at dramatic junctures. Williams’ ensemble consisted of: 4 horns, piano, 3 percussionists (including the composer’s father and brother), 11 violins, 5 violas, 4 cellos and 2 basses. Nightwatch opens with John Williams’ dynamic theme music set against Reza Badiyi’s striking title sequence. The next 18 minutes of “The Suitcase” play without underscore as Supt. Owen Kerr (Andrew Duggan) and Lt. James Van Ducci (Carroll O’Connor) of the Great Lakes Interstate Bureau’s Chicago office launch an investigation into a bomb threat aboard a Swedish freighter. A bit of source music (“When the Saints Go Marching In,” recorded on location) plays for scenes of Officer William Smith (Michael Murphy) partying the night away in Milwaukee until being called back to Chicago. While the G.L.I.B. bomb squad searches the freighter, Van Ducci and Smith question the crew, discovering that one of them — Bertil Granstrom (played by Swedish actor-director Gunnar Hellstrom) — has jumped ship. The search turns up evidence someone has manufactured a time bomb aboard the vessel, but no sign of the device itself, leading Van Ducci to conclude that Granstrom must have taken it with him. When Williams’ underscore finally enters, it packs a wallop. A 5/4 rhythmic ostinato mixes with a pounding timpani figure in 4/4 time and an ominous brass fanfare derived from a descending minor third as Granstrom makes his way along Chicago sidewalks carrying a suitcase with the bomb inside. Back at the waterfront, Lund (Albert Paulsen) — the sailor who actually built the bomb — protests when the ship’s captain announces that the police found no explosives aboard. Williams begins his cue with an outburst of scurrying strings as Lund races onto the freighter, subsiding to low phrases when he reaches the deck. Quiet horn chords mix with tremolo strings and percussion as Lund climbs a mast. The cue concludes with a reprise of the “Bertil’s Bomb” material for more footage of Granstrom on the streets of Chicago. Smith begins to climb the mast to talk with Lund. Williams’ music simmers unsettlingly, reprising material from “Lund’s Problem” as the disturbed sailor admits that the bomb is now in a suitcase carried by Granstrom, who believes it to contain a cradle he carved for his unborn child. When Lund begins to climb down, a repeated two-note pulse in octaves escalates tension until an ascending horn phrase screams out as the bomb-maker jumps to his death. The “Bertil’s Bomb” material returns once again as Granstrom follows a hoodlum (Don Rizzan) — who he believes to be a Good Samaritan helping him locate a street address — down a sidewalk and into an alley. The pounding timpani figure fades into source music from an adjoining nightclub. A bluesy organ number emanates from the nightclub as Granstrom receives a beating from three hoodlums. Eerie textures for high strings and low horns meander over an uneasy string bass ostinato as Granstrom struggles to maintain consciousness. Granstrom stumbles into an all-night Swedish bath, where the camera zooms in on his bloodied face as the cue crescendos to a conclusion. Granstrom hitches a ride to his sister-in-law’s house in Milwaukee, where only his young niece, Kathryn (Linda Wallenberg), is at home. Williams’ music captures her silent terror at the sight of a strange man attempting to break into the house while shouting in Swedish. The music simmers quietly for a cutaway to G.L.I.B. headquarters back in Chicago, resuming its momentum as the action returns to Kathryn’s house, where Granstrom’s hand reaches through the front door. Solo horn leads a crescendo, with trilling strings cutting off just as the phone rings — G.L.I.B. officials are on the line, attempting to track down the sailor. When Granstrom manages to unlock the door, Williams’ music erupts as Kathryn drops the phone and rushes out the back of the house. A descending horn figure joins tense string writing as the sailor chases after her. The “Bertil’s Bomb” music returns as Granstrom struggles to catch up to Kathryn while avoiding a patrol car. Granstrom approaches his niece, now trapped against a playground’s chain-link fence. Williams’ music enters ominously as the sailor sets his suitcase on a park bench and continues with scurrying string phrases against moaning low horns as Granstrom speaks to the girl in Swedish. Kathryn directs her uncle toward a nearby hospital, where her aunt — Granstrom’s wife — will soon give birth. An ascending horn phrase (recalling a similar passage from “Lund’s Leap”) concludes the cue on a cut to a squad car carrying Kerr as it speeds him to a Chicago heliport. Already weakened due to the beating he received earlier, Granstrom sustains further injuries jumping a fence. Low string outbursts lurch along with the Swede as he stumbles about, upper strings crying out passionately as he collapses in the middle of a street. A lonely horn solo enters when a car approaches, then fades away as the driver speeds off to fetch help. An ambulance delivers Granstrom — and his suitcase — to the hospital’s emergency room, right under the noses of a large police contingent expecting him to arrive on foot. The timpani motive yields to quiet percussion over a sustained string chord for a bit of dialogue between two nurses, then swells forebodingly as the camera settles on the suitcase. Percussion and pizzicato strings generate unease as Granstrom sneaks out of his hospital room and carries his suitcase to an elevator, the cue subsiding to a simple electronic pulse when he arrives at the maternity ward. Strings temporarily join the pulse in octaves, along with a smattering of percussion, but eventually fade away, leaving only the repeating electronic tone until Granstrom’s sister-in-law catches sight of him and calls out his name. The music explodes in a riot of frenetic strings and percussion as Smith rushes toward Granstrom, grabs the suitcase and races out of the hospital to the far edge of its empty parking lot. The cue concludes with a long string trill as the G.L.I.B. bomb squad approaches the device. Sympathetic string writing underscores Granstrom communicating with Van Ducci in the maternity ward, adding solo horn when the detective permits the sailor to attend the birth of his child. A trilling crescendo concludes the cue as the screen action again focuses on the explosive. Solo horn leads into warm string writing as the bomb squad deactivates the device — with eight minutes to spare — and Granstrom celebrates the birth of a baby daughter. Van Ducci turns pensive, thinking of his own daughter: she is flying off to Paris that morning against his wishes, and he has missed his chance to bid her farewell. The cue resolves with a warm major chord as a plane flies over Lake Michigan into the rising sun. Williams’ series theme returns for the closing credits, omitting the opening eight seconds, but otherwise identical to the main title. 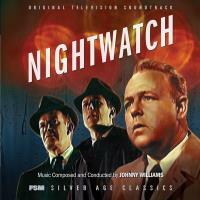 In November 2011, Film Score Monthly released Williams’ entire score from Nightwatch on a CD (FSMCD Vol. 14, No. 16) coupled with Quincy Jones’ score for Killer by Night. While the bulk of the score was remastered from ¼″ monaural tapes (the only existing source), the theme and format music survived on ½″ three-track tape (allowing their inclusion in vibrant stereo). This program has never been released on video in any format. University Press of Mississippi, 2000. 276 pp. Farrar, Straus and Giroux, 2006. 336 pp.